Things are a bit quiet in climate blogging - so with a weekend coming I'll honor my ancient promise of diverting to some recreational math. I saw a few weeks ago a mention at Lucia's of the old twelve coin problem. Twelve coins, one of which is fake and of different weight to the others, and to be found with three weighings on a balance (Update: the usual spec, as here, is that you also have to say whether it is heavier or lighter). This first came to prominence in WWII, when it was said to have become a distraction to the war effort in places like Bletchley Park, leading to suspicions that it had been planted by the Germans. A suggested counter was for the RAF to drop it on Germany. I first encountered it when I started University; it was posed in circumstances where I was expected to be able to solve it, and I was embarrassed. A year later, I went to a lecture on information theory (newish in those days). I was struck by the proposition, helpful in later years, that the information in a result was a function of prior uncertainty. So that is the clue - each weighing should be arranged so each of 3 outcomes was as near equally probable as could be managed, maximising prior uncertainty. Then I could solve it easily, and also versions with more coins. The basic constraint is that in N weighings there are 3N possible outcomes, while with n coins, there are 2n situations to resolve, since only once coin is false, and could be heavy or light. So for 12 coins, there are 24 possibilities and 27 outcomes of 3 weighings, so it is tight but possible. An alternative to the equiprobable outcome method is a requirement that each weighing should be so that each outcome was resolvable with the remaining weighings. I have encountered at WUWT ongoing complaints about HADCRUT 4 updates. It is currently in a thread here, but goes back to an earlier post here. The complaints typically say that the new versions always raise current anomalies, and suggest that they are poorly documented. In fact, the changes are extensively noted; see directory here. In the earlier thread Tim Osborn commented here, to say mainly that the changes were due to changes (mainly additions) to station data, and listed the particular additions to HADCRUT 4.3. He also later made the important point that there is a good reason why the trends rise with new data. HADCRUT is a land/ocean set, but the empty cells are mainly on land, and the new data allows some of them to be filled. HADCRUT is an average by grid (area-weighted), in which cells without data are simply not included. That has the effect of assigning to them the global average, which is dominated by sea temp. If new stations assign to empty cells genuine land values, that will increase the trend, because land is warming more rapidly. HADCRUT had artificially low trends because of this missing value policy, as was remedied by Cowtan and Way (2013) - discussed here in a series of posts, with links here. But another feature of HADCRUT transparency is insufficiently appreciated. For Ver 4, at least, they give a complete listing of station data for each version, with each station file documented. Here is a typical version file; it is for 4.4, but just change that URL to 4.2 or whatever you want. Each links to a zip file of the station data for that version (except for Poland), which has a URL like http://www.metoffice.gov.uk/hadobs/crutem4/data/previous_versions/4.4.0.0/station_files/CRUTEM.4.4.0.0.station_files.zip. I'm spelling out the URL because if you click on it, it will immediately download about 18Mb. But again, you can edit for other versions. UEA has an explanations file here, which is the best source I have found for the source id codes, but unfortunately it dates from 2012, and there is a new one pretty much with each new dataset that has come in. I'd be glad to hear of something more recent. It isn't really a problem, because the later numbers are in order of addition, so are easy to work out. Note that the files are in number order, but countries are not necessarily consecutive blocks. So I thought I would just post this information, so that people who really want to know what HADCRUT is up to can look it up. I may in future produce a Google map. As many have now noted, Arctic sea ice stopped melting rather abruptly after 6 September, and has lately been freezing quite rapidly. The pattern is quite similar to last year, but a few days earlier. In both JAXA and NSIDC the minimum was lower than 2007, but higher than 2012, so in secoind place (but in NSIDC, only just). Meanwhile, more surprisingly, Antarctic ice has been melting strongly for six days, and now stands below the other years of this century at least, for this time. 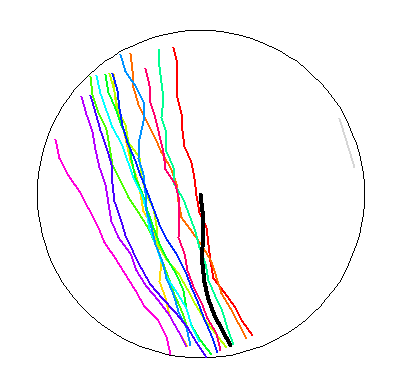 From the radial plot here, I'll show the NSIDC plots for recent days. The plot spans most of September. The red curve is 2002. Orientation same as NH. I have been describing and responding to blog arguments about climate feedback and circuit analogies here and here. The arguments have continued, and they do provoke ideas. I'm going to write some down in this post. The usual circuit analogy has surface temperature as voltage, and TOA flux as current. I showed in the first post that the feedback, including Planck, could be regarded as conductances. It's interesting to probe what this might mean. The units are watts/m²/K, which are actually the units of entropy/s/m². Does entropy make sense? I wrote about entropy and atmospheric fluxes here and here. Sunlight (Q=240 W/m² global average after albedo) arrives, does things, loses the capacity to do work, and eventually leaves as thermal IR. It has accumulated entropy, or if you prefer, lost free energy. You might think that with a heat sink at 3K (space) the heat could go on doing work. But in fact you need a miniumum temperature to radiate that flux to space, which for Earth is about 255K (note 1). That constitutes a resistance. To get Q=240 W/m² to flow to space, you need 255K (voltage). In our system, that resistance, inverted, is the Planck conductance, or feedback. It represents the entropy flux to space. It's really the maximum or optimal entropy flux for 240 W/m². In fact, emission to space comes from a rather large component at about 225 W/m², from GHGs, and some from the surface at average 288K (atmospheric window). We know uniform blackbody emission exports most entropy for a given flux, because any variation means that more entropy could be generated by transporting heat from the hotter parts to cooler. This lies behind a supposed failing proclaimed in a WUWT post of Lord Monckton. The Planck feedback calculated for the Earth at 255K, the temperature for uniform BB emission of 240 W/m², is 3.75 W/m²/K, and Lord M thinks they erred by not using it. But its inadequacy has been long known, and I wrote in the previous post how Soden and Held (among others) did a thorough study with GCMs to get a value of about 3.2 W/m²/K. The difference is usually attributed to absorption in the atmosphere, but thermo gives an alternative viewpoint, which I find more useful. It is the entropy export reduced by the non-uniformity (sub-optimality) of apparent emission temperature. 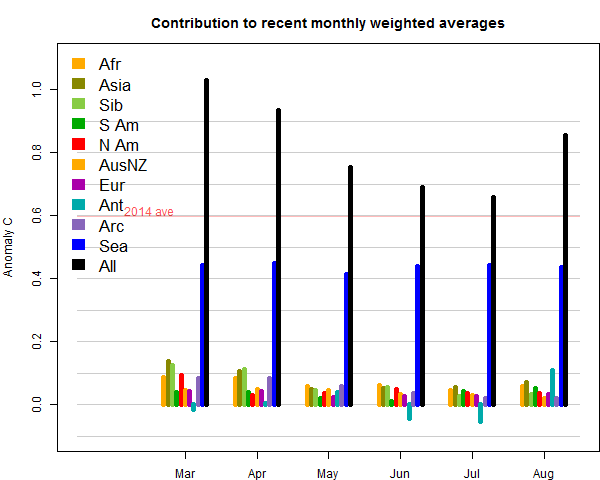 GISS is up from 0.85°C in July to 0.98°C in August. This compares with a larger rise of 0.21° in TempLS (but GISS rose in July when TempLS dropped slightly, so over two months, about the same), and is much more than the small rise in the NCEP/NCAR index. It is also the warmest August in the record (next was 0.79°C in 2011). I'm planning a new page which has gadgets that I use for blog writing etc. The first entry is likely to be a Unicode writer; here is a draft you might like to try. Unicode is the massive collection of special characters which you can probably access using your system cahacter generator - on Windows it is a Windows Accessory called Character map. Unicode chars come in groupings; a good listing is here. Each char has a number and you can render them in HTML using the scheme &#2022; for character 2022 (in decimal). But they are widely rendered and usable as characters, in browsers and editors. The first 255 chars are just ascii. A particular aspect of usability is that you can use them in blog comments where most fancy html is not allowed. You can cut and paste from a char map as in Windows, or write the long form HTML as above. But that is tedious, as they come in lists of thousands, many for all the various language scripts. So I've collected a manageable table which I think has most that I'll ever need, and added an editable phrase generator, below the jump. Surprising, but TempLS mesh is so far an outlier here. 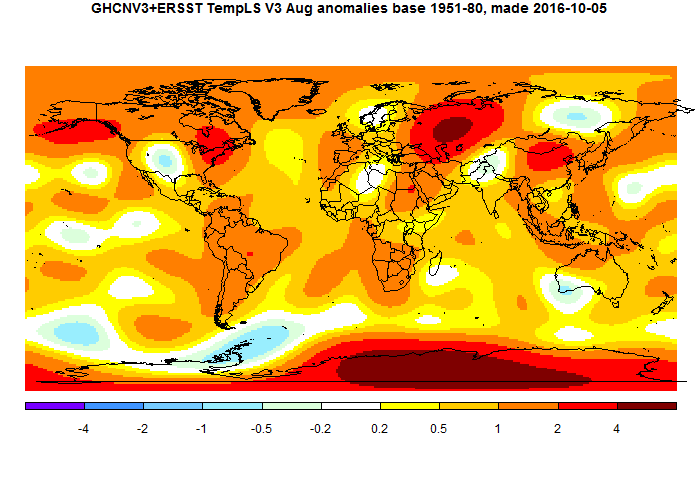 The TempLS mesh global anomaly rose from 0.65°C in July to 0.86°C in August (base 1961-90). This is a change after a period of slow decline, and is almost back to the level of last January. TempLS grid showed a much smaller rise of 0.043°C. These results are consistent with the NCEP/NCAR index (up 0.02°C). The satellite measures varied; UAH6 LT was up 0.05°C, but RSS down just 0.01°C. The reason for the discrepancy seems to be the big variation in Antarctica, which is variably seen and weighted. The regional temperature variations are similar to those in the NCEP/NCAR report, though the warmth in Russia is more pronounced. 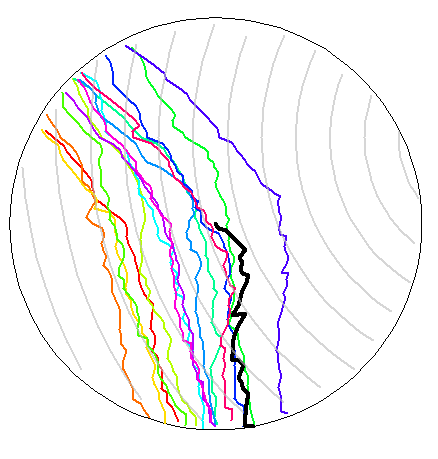 In the breakdown plot, you can see the big contribution from the change in Antarctica. SST also rose significantly. On this basis, I would expect a rise of at least 0.1°C in GISS, with maybe smaller rises in NOAA and HADCRUT (less affected by Antarctica). In other news JAXA sea ice extent had a late melt rush and dropped below 2007 to be second only to 2012. 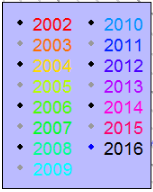 It won't catch 2012, and the main marker remaining is whether it will drop below 4 million sq km. It is 4.023 now. NSIDC is also second place. Recently I posted on Climate feedbacks and circuits. It was in the context of a series of articles by Lord Monckton at WUWT. The articles have continued, with more promised. Willis has joined in, though they are not always on the same page. And I've been commenting there. My main observation is that this is just like Ohm's Law, with the feedback coefficients c as conductances in parallel. The need to resort to active feedback comes from the fact that some c's, corresponding to positive feedback, may be negative. But the basic simplifying idea off adding conductances still applies. In a much-cited review paper, Roe 2009, roe argues that feedbacks should be seen as Taylor series in disguise. I think he could have said just chain rule, since he uses only first order. But I want to develop this, because it is the basis for the method used in an also much-cited (including AR4) paper by Soden and Held, 2006. Lord M's latest post is based on the claim that S&H have made an error, but he really has no idea of what they did. So I'll try to say something about that here. For the second month running, the Moyhu NCEP/NCAR index rose slightly, from 0.414°C to &0.428°C. Temperatures were warm mid-month, but dips at start and finish. As usual, the reanalysis shows local variation in Antarctica, where data is patchy, but overall it seems warmth predominates. Otherwise few major features - East Europe was warm. There seems to be a "pause" in cooling, which increases the likelihood of record heat in 2016. In other news, there has been a late spurt in JAXA sea ice melt, which seems likely to take 2016 minimum past 2007, and exceeding only 2012. NSIDC says similar.